Public housing in lower Manhattan in New York City. Do black and white children who live in assisted or subsidized housing experience different life outcomes? That question was at the center of a new study by Sandra Newman and C. Scott Holupka, two researchers at Johns Hopkins University in Baltimore. 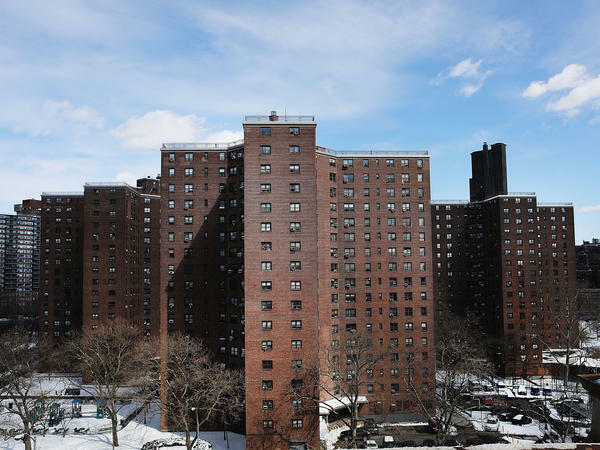 They combed through federal data on households in public housing or those that received housing vouchers from the 1970s through the first decade of the 2000s. What the pair found was neither straightforward nor surprising. When it came to life outcomes, living in assisted housing didn't predict significant differences in how children turned out because of their race, a big change from decades past. They also found that black and white people living in subsidized housing in the first decade of the aughts were living in homes of comparable quality, which was not true in the past. But while they found parity in the housing conditions in which black and white households lived, there were still wide disparities in the neighborhoods in which their homes were located. "Despite achieving equality and access to quality public housing, because of historical and structural forces, black families are more likely to live in central cities," Newman said — that is, places with more concentrated poverty and the problems that come with it. By contrast, white families in assisted housing were more likely to live on the edges of those cities, or in the inner-ring suburbs — which often meant access to better schools and public services. "Living in a better place can have a very good influence on these outcomes," Newman said. The researchers said that the study's findings were concerning given the number of children involved: In 2011, there were about 1.9 million households with children living in assisted housing across the country, and nearly half of children who lived in assisted housing in the United States were black. The researchers found that black families in assisted housing were likely to have been on welfare longer than white families in similar situations; they also had lower household incomes, and were more likely to have a head of household with a disability. "We really need to understand the neighborhood, because it's the key to unlocking these [more advantageous] family backgrounds," Newman said. The data they analyzed bore out this neighborhood effect: black kids who lived in assisted housing in neighborhoods with better services and resources had better outcomes than those in public housing in more economically distressed areas. But there are challenges to keeping affordable housing from being concentrated in poorer inner cities. One is social: families with fewer resources rely on their close ties for things like childcare and transportation. "Even if people were given a [housing] voucher where they can choose where they live, people tend to pick places with which they're already familiar," Holupka said. The other is local politics. Holupka pointed to Johns Hopkins' own backyard, which is dealing with an ongoing affordable housing crisis. "Look at Baltimore City," he said. "It would need to work with other housing authorities" — the local public-private agencies that oversee assisted housing — "to give assistance to families looking to move for housing elsewhere." About 150,000 people in the city — around a third of its renting households — live below the poverty line at a time when rental costs have sharply increased. "It's not like some suburban jurisdiction is going to say, all these people from the inner city need housing so let's make more available," he said. The study comes at a time when Republicans in Washington seem to be considering dismantling a fair housing provision put in place under the Obama administration to address such concerns. Under the rule, known as Affirmatively Furthering Fair Housing, local housing agencies that receive federal money for housing must keep data on the racial demographics of the people who live in affordable or subsidized housing — and take steps to remove barriers to housing for low-income earners. HUD ordered 22 jurisdictions to comply in the first year of the AFFH rule, including three major cities: Philadelphia, New Orleans, and Kansas City. [...] The Kansas City area agreed to try distributing Section 8 vouchers more evenly across the region, with the goal of breaking up concentrations of poverty in central cities, helping residents to access areas with better schools and more job opportunities. During the presidential campaign last year, Donald Trump pledged to do away with the rule. Ben Carson, President Trump's housing secretary, was on the record as opposing it years ago. For now, though, it seems Republicans have turned their attention elsewhere. "[The rule] is being ignored," Newman said. "It hasn't been overturned yet — but it's not being enforced."